Back in 2013, Nissan issued a press release stating that its technical center in Europe would begin testing a “self-cleaning” Nissan Note in a variety of conditions. Note is a little hatchback, and self-cleaning refers to a coating called Ultra-Ever Dry® which is being marketed and sold by UltraTech International Inc.®. The product is described as a super-hydrophobic and oleophobic paint that is impervious to water and oils. However, Ultra-Ever Dry is not paint but rather a coating that is applied to a painted car in two steps. The result leaves behind a film of silica and fluorocarbon coating. Reportedly, the coating has responded well to common uses and has effectively stopped rain, road spray, frost, sleet, and standing water from creating dirty marks on the car’s surface. However, Ultra-Ever Dry is not yet ready for prime time. For example, the product dries to a white and hazy appearance, and it is unusable on windshields and mirrors. It also applies unevenly and is susceptible to damage from UV as well as detergents and solvents. Nissan says it will continue to consider the coating as a future aftermarket option. Another self-cleaning technology has been discovered by a group of researchers from University College London, Imperial College London, and the Dalian University of Technology in China. 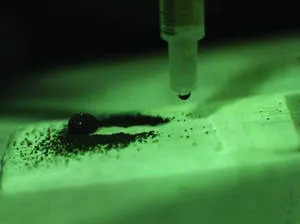 According to the literature, this group devised a suspension of coated titanium dioxide nano-particles that can be spray-painted or dip coated onto a range of hard and soft surfaces, including paper, cloth, and glass. The coatings resisted rubbing, scratching, and surface contamination. Self-cleaning surfaces work by being extremely repellent to water. For example, commercial car washes apply products such as wax and polymers that have a low affinity for water. So, rather than spreading out and wetting the surface, excess water on the surface beads up and creates spherical droplets like marbles that roll off the vehicle. The problems with waxy surfaces and other hydrophobic coatings are they can be easily damaged, rubbed off, and exposure to oil and environmental conditions degrade performance. How do the nano particles work? According to the research, two different sizes of particles are used to create an uneven surface (i.e., lotus leaf structure) and particles are coated with perfluoro silane, a compound that produces a waterproof surface. After making paint with the coated particles, commercial adhesives are used to bond the paint to various substrates and promote robustness. These surfaces maintained water repellency after finger-wipe, knife-scratch, and 40 abrasion cycles with sandpaper. Currently, the formulations developed can be used on clothes, paper, glass, and steel for a myriad of self-cleaning applications. However, researchers say more development work will be needed to determine if the paint can meet the car industry’s requirement for a glossy surface and other needs. While you can’t buy a self-cleaning car yet, you can buy one with a finish that repairs itself. For example, in 2005, Nissan introduced Scratch Shield, a clear coat that is more scratch resistant compared with conventional clear coats. The product helps a vehicle maintain its new look longer and it also takes care of fine scratches, repairing surfaces close to their original state in one day to one week. According to the company’s website, a special highly elastic resin is combined with a conventional clear coat to increase the paint’s flexibility and its strength by raising the resin density. Nissan says it will continue to expand the adoption of Scratch Shield globally. While this may not be of consequence to car wash operators, it may be to detailers and firms like Chips Away. According to professional detailer, Kevin Farrell, scratch resistant paint is very hard and requires more aggressive methods and products and more time-consuming techniques for paint correction. Chips Away International is a major player in SMART (small-to-medium-area-repair-technology) market with over 200 franchises in the U.K. as well as presence in eight other countries. Chips Away provides high quality, value-for-money repairs to car paintwork on a same-day basis. Arguably, paint that repairs itself would not be thought of as good for business. However, that isn’t the sentiment conveyed on the company’s website. For example, Chips Away believes it is worth paying for paint protection for cars when sold by a reputable dealer or specialist on new and nearly new vehicles in order to protect paintwork and shine. Naturally, Chips Away sells its own brand of paint protection, Supagard. In the final analysis, it will be some time, if ever, before self-cleaning car paint is of concern to car washers and detailers. In the meantime, car wash operators should make the most of the opportunity to jump on the protection bandwagon. For example, just about every car wash operator offers a basic spray wax but not all operators offer protection. According to Auto Laundry News surveys, 54 percent of self-service, 44 percent of exterior, and 27 percent of full/flex respondents do not offer surface protection (i.e., repellent). Given the strategy in the automobile industry to make people’s lives easier, I dare say this should be zero percent.